A period of 41 years had passed before a U.S. District Court Judge in California overturned the conviction of Fred Korematsu, an Oakland shipyard foreman of Japanese ancestry who dared to challenge the constitutionality of Executive Order 9066. The 1942 order authorized the removal of more than 120,000 people of Japanese descent from their U.S. homes and into internment camps. A majority of those prisoners, like Korematsu, were American citizens. Korematsu appealed his 1942 conviction by a federal court for defying military orders issued under Executive Order 9066. However, in 1944, the U.S. Supreme Court upheld the conviction, stating that Korematsu’s incarceration was not caused by racism and that the internment of Japanese Americans was a military necessity. While the U.S. Supreme Court decision still stands, on Nov. 10, 1983, Judge Marilyn Hall Patel overturned Korematsu’s conviction. That it took 41 years for a U.S. judge to recognize the injustice done to Korematsu reflects a need to ensure that our nation’s judicial body be one that is representative of and culturally sensitive to the people it serves, APIA activists say. Despite Asian Americans and Pacific Islanders making up 10 percent of Washington State’s population, there are just 12 APIA judges out of 217 seats — 10 of 186 at the county level, two of 22 at the state level, and none of the nine in the State Supreme Court. The state constitution mandates that Washington’s judges be elected, rather than appointed, as some other states do. This election season, Washington state voters get to determine the future of 59 judicial seats. For voters who haven’t been as enthused about their judicial candidates as their legislative counterparts, there are some startling realities to consider. Tana Lin, an attorney with the Asian Bar Association of Washington, hopes APIA voters realize that judges can have a lasting impact on our everyday lives. Lin pointed to judges’ roles in divorces, child custody disputes, car accidents, insurance claims, landlord/tenant disputes, contract disputes, employment problems, and criminal involvement — whether as a victim or alleged perpetrator. She said these judges may also be deciding our nation’s most important cases one day. “State court judgeships can be a stepping stone to the federal court bench,” Lin said. Seattle University law professor Robert Chang said voters also need to remember that judges at all levels play a crucial role in ensuring that cases are tried fairly. “APIA voters, like all other voters, have a responsibility to inform themselves of the qualifications of judicial candidates and to decide who will be tasked with judging individual cases and working to ensure the fair administration of justice,” said Chang, executive director of the Fred T. Korematsu Center for Law and Equality, a nonprofit organization that works to promote fairness in U.S. courts. To illustrate the need for a fair administration of justice, Chang referred to a recent amici curiae brief submitted by the Fred T. Korematsu Center for Law and Equality. The brief pointed to the State of Washington v. Phiengchai Sisouvanh. The defendant was a lowland Lao national, who spent the first few years of her life in a Thai refugee camp, before arriving in the United States in 1991. Sisouvanh, 23 at the time, was charged with the murder of a pregnant woman (the nearly full-term child survived) in 2008. She was found guilty and sentenced to life imprisonment without parole. The problem put forth by the amici was that Sisouvanh was found competent to stand trial by a psychologist who assumed that she had led “a pretty average American life,” with no knowledge or understanding of her Lao cultural background, religion, or refugee experience. Specifically, the brief called on the Washington State Supreme Court to consider the cultural competency in the administration of a mental health examination to determine whether a criminal defendant was competent to stand trial. The brief stated, “Due process prohibits the trial or conviction of an incompetent criminal defendant. When competency to stand trial is at issue, court-appointed mental health professionals are called on to evaluate the competency of the defendant, acting as Constitutional gatekeepers who help to determine in the first instance whether an individual may face criminal jeopardy in our courts. This critical gatekeeping function — the evaluation of a defendant’s competence to stand trial — must be performed in a culturally competent manner. In another case, Katare v. Katare, relating to child custody, the center submitted an amici curiae brief that highlighted prejudicial testimony against Brajesh Katare, a man of Indian descent, who was married to Lynette Katare, a woman of European descent. A court ruling had restricted Mr. Brajesh’s two children to accompany their father on international travel. The ruling, the brief stated, was based on evidence that relied on stereotypes, inaccurate characterizations of Indian civil process, and risk profiles that emphasized national origin and culture without safeguards to avoid bias. An expert, who testified on behalf of Ms. Katare with regards to child abduction, said Mr. Katare’s Indian roots increased his risk of being an abductor. The brief said the testimony was largely based on bias and inaccurate assumptions of Mr. Katare, based on his race and his family ties to India. In addition to deciding cases immediately before them, Chang explained, judges also play a leadership role with regard to setting court rules that ensure fair and equal access to the courts. Chang points to the efforts by King County Superior Court judges to create a rule that protects individuals and families from U.S. Immigration and Customs Enforcement (ICE). “Judges thought it was important that those seeking justice and others participating in the justice system as witnesses be free to participate in the legal process without fear of immigration enforcement,” Chang said. Jeffrey Liang, incoming president of the Asian Bar Association of Washington, said that while it may appear that Washington state voters do not seem to hold judicial election as its highest priority, the API community does recognize what is at stake and appreciates fighting for a judicial body that’s sensitive to the state’s unique cultural complexities. “There are always racial issues in the judicial system and you want to have justices who understand those issues,” Liang said. 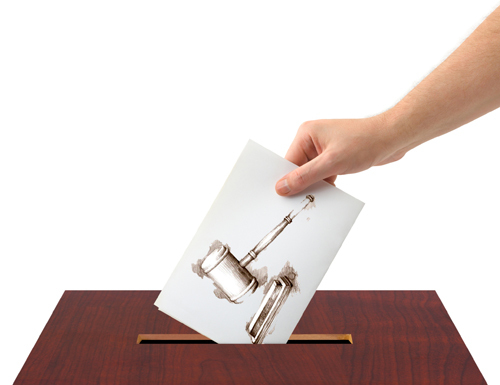 With the primary election nearing on Aug. 7, there’s still time to get informed about your judicial candidates. Because the judicial races are non-partisan, there’s no runoff, per se, to be determined in the general election. Judicial candidates who receive more than 50 percent of the vote in the primary are effectively the winners. For Washington State voters, getting informed on judicial candidates may require some online research. While King County voters may have received their voter’s guides in the mail last week, there will be no printed statewide guide published by the Secretary of State this year. For more information, visit www.sos.wa.gov/elections. or www.votingforjudges.org. Travis Quezon can be reached at info@nwasianweekly.com.